Given the prominent place QSAR has in my thesis, this is somewhat surprising. Anyway, here is some more QSAR modeling talk. Gilleain implemented the signature descriptors developed by Faulon et al (see doi:10.1021/ci020345w; I mentioned the paper in 2006), and the CDK patch is currently being reviewed. With some transformations, the atomic signatures for a molecule can be transformed into a fixed-length numerical representation: [70:1, 54:1, 23:1, 22:1, 9:9, 45:2]. This string means that atomic signature 70 occurs once in this molecule and signature 9 occurs nine times. At this moment, I am not yet concerned about the actual signature, but just checking how well these signature can be used in QSPR modeling. For my test case, I have used the boiling point data I used in my thesis paper On the Use of 1H and 13C 1D NMR Spectra as QSPR Descriptors (see doi:10.1021/ci050282s). Some of this data is actually available from ChemSpider, but I do not think I ever uploaded the boiling point data. 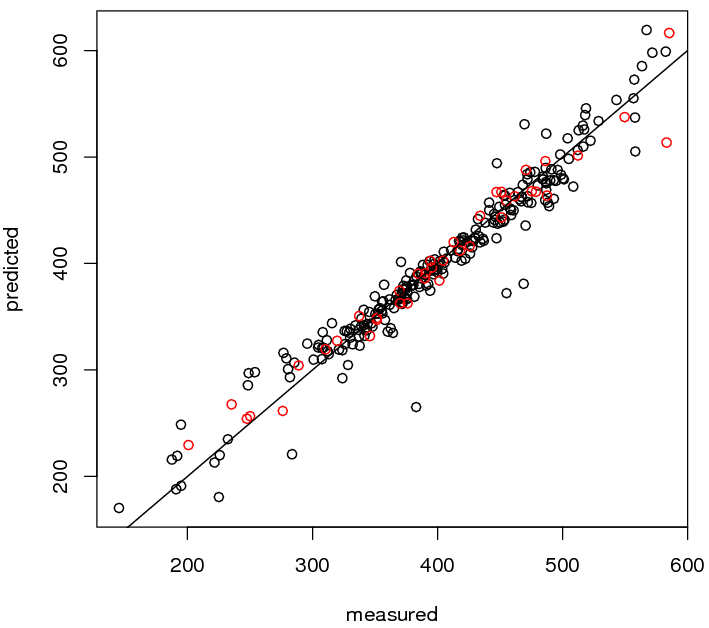 This constitutes a data set with 277 molecules, and my paper provides some reference model quality statistics; that way, I have something to compare against. Moreover, I can use my previous scripts to do the PLS modeling (there are many tutorials online, but you can always buy an expensive book like the one shown on the right, if you really have to), (10-fold) cross-validation (CV), and 5 repeats of random sampling. I know 42 is the answer to the universe, but 42 latent variables (LVs)?!? Well, it’s just a start. A more accurate number of LVs seems to be around 15, but my script had to make the transition from the old pls.pcr package to the newer pls package. And I have yet to discover how I can get the new package to return me the lowest number of LVs for which the CV statistic is no longer significantly different from the best (see my paper how that works). Actually, I have set the maximum LVs to consider to 1/5th of the number of objects (which is about the accepted ratio in the QSAR community); otherwise, it would have happily increased. However, the five repeats nicely show the variance in the quality statistics, R2, Q2, and root mean square error of prediction (RMSEP). From the numbers, a model with Q2 = 0.94 is not better than one with Q2 = 0.93 (and I have seen the variance quite some larger). Bottom line: just measure that variability, and put it in the publication, will you?? And there are so many other things I like to do. But this will do for now. To leave a comment for the author, please follow the link and comment on their blog: chem-bla-ics.